How do I show my copyright for photos? When you press down on the shutter release you have established a copyright in the resulting image. You may then state your copyright. Many people will place an extensive copyright statement on the About page of their website. Copyright © 2016 Ludwig Keck. All rights reserved. In my case here the copyright notice was placed into the EXIF, properties, fields by my camera. It does not have the symbol © hence I use the alternate form. Also notice that in my photo files the notice appears in two locations, the Copyright field and the Comments field. Keep in mind that any thief can easily delete or replace this information. Not all cameras allow for this feature. For photos from other cameras I add the notice with a bulk select and opening the Properties dialog and I copy or type the notice in. I also add my name in the Authors field. Note the short form copyright notice (there are links above and below this notice to my “gateway” sites). All the notices don’t make a bit of difference to thieves. Images are still stolen all the time. I protect a little against that by only posting low resolution images (generally about 1200px on the big side). At least this will make the images not suitable for printing or where better resolution is required. You can also register a photo, or a collection of photos, with the U. S. Copyright Office or equivalent agencies in other countries. The process takes some time. In the U.S.A. there is no charge, however a copy of each image must be supplied to the Copyright office. I have done that only with books, not my individual photos. Such registration gives you some additional rights and protections that come into play only in law suits. You have to go after the bad guys in court, nobody else does that for you. It is costly as you can imagine. I should also point out that just because you have taken the photo you may not be fully entitled to use it any way you like. The little thumbnail photos above show people in recognizable form. That entitles them to protection of their own likenesses. I did not get “model releases” for these photos and therefore I am rather limited with what I can do. I can use them in blogs as those are “news stories”, but I can’t sell those images as “wall art” or for use in advertising or what-have-you. Please note that I have explained here what I do. I can not tell you what you should do as I am not a lawyer and thus not qualified to give legal advise. Consult with a lawyer to learn what is appropriate in your own case. Where does the “Original size” of a picture in Microsoft Word come from? When a picture is inserted in a Microsoft Office Word document it is scaled to fit. The size can be set to other values to suit the document. In the Size dialog window the size of the picture is shown in inches and as a percentage of the “Original size” which is also given as the height and width in inches. So, how does Word come up with the “original size”? The EXIF data of photo files contains a couple of values name “X resolution” and “Y resolution”. In a Windows Properties box they show up as “Horizontal resolution” and “Vertical resolution” and are given in “dpi”. That last item, the unit of measure, “dpi”, stands for “dots per inch”. There is your big clue. Using “dots” was the way pictures were printed on paper in the old days. Well, if you pick up a newspaper you can still see them nowadays. These resolution values do not describe anything relating to the picture, they are setting instructions for printers. They can be changed by a number of programs. Changing these values does not affect the picture at all. The number of pixels stays the same, the color depth is not affected. So these values can be changed at will. Several programs, in fact, do that. Cameras set these values, most to 300, some to other values. 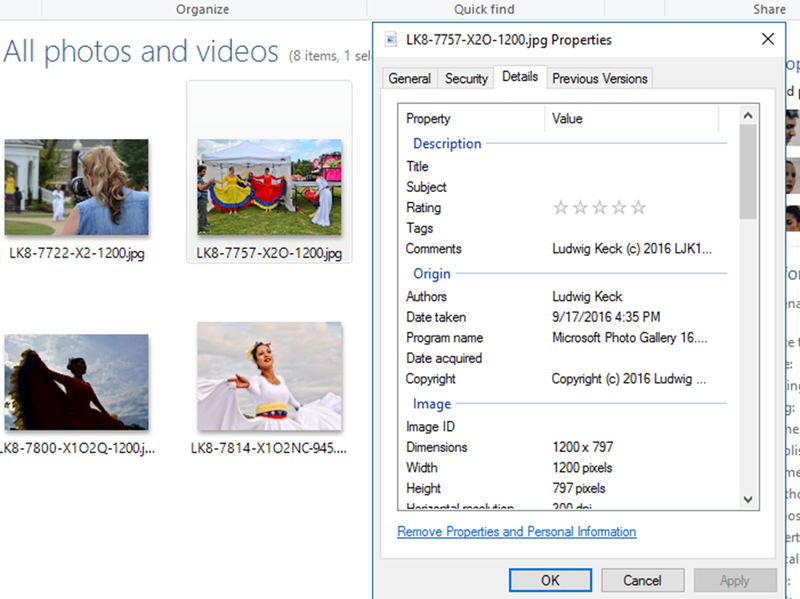 When Windows Live Photo Gallery makes a JPG copy of a photo it sets the values to 72. Some other editors use 96. I have one that uses 472, another 262. It really does not matter. For the most part these numbers are meaningless. Microsoft Office Word, however, uses these resolution values as they were originally intended: As printing instructions specifying the dimensions of the printed picture on paper. If you have a photo that is 768 pixels wide and the horizontal resolution value is set to 96, then the picture printed size is 8 inches (8 inch multiplied by 96 dots per inch yields 768 dots – the pixels dimension of the picture). So Word will set the “100%” size to 8.0 inch – if this does not fit in the margin settings, the picture will be scaled down and the Scale value will be a lower number. Normally that is not a problem as most pictures have either 72 or 96 set as the resolution value. If the 768 pixel wide picture had the resolution set to 256 then Word would calculate the width as 768 / 256 = 3 inches. It would most like be set to that value and look somewhat small. It is perfectly acceptable to increase the size setting. If you want the picture to appear 6 inch wide you can set the scale to 200%. Word keeps the original number of pixels of the picture intact until the document is printed or saved with certain save or export options. Why do I sometimes get spots in my photos? The full inquiry stated that the dark spots were usually seen in the sky part in photos and sometime they were almost indistinct, other times very noticeable. The camera used was a DSLR and the lens kept clean. Here are samples of such spots. These five photos (these are enlarged sections) show the same sky and tree at right. They were taken at different aperture settings, as indicated. You can see that for large apertures (small f/number) the spots are larger and lighter. In the photos at even larger apertures the spots were not noticeable. This explains the mystery of sometimes getting spots and not at other times – the aperture will, of course, be different for different photos. So sometimes, with a small aperture (large (f/number), the spots are there, and they are not visible in photos taken at large apertures. These spots are made by very tiny dust flecks on the rear of the lens. Indeed, this dust was almost invisible to the naked eye. When the lens is stopped down the light bundle forming the image at any one spot is very small and even the tiniest dust particle can cast an appreciable shadow onto the sensor. It is very easy to miss cleaning the rear of a lens. It is not exposed to the elements except when changing lenses, so you might not think about it. Normally we keep the rear caps on, so there are but a few seconds when dust can get on the rear of the lens. Unfortunately, that is time enough. So be sure to not only keep the front lens surface clean, but the rear of of lens as well. When importing photos from a camera, Windows Live Photo Gallery, in the default mode, creates a sub-folder for each group of photos on the camera. 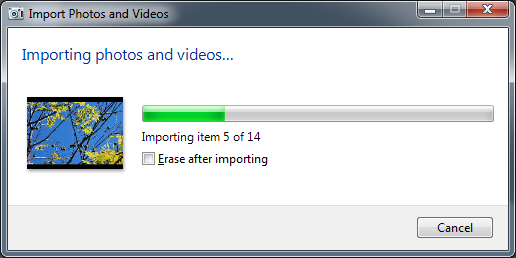 The import dialog looks like the illustration here. The photos on the camera are presented in groups, ordered by date and time, usually one group per day. The grouping is adjustable. There is an “Enter a name” box for each group, see the red pointer in the illustration. 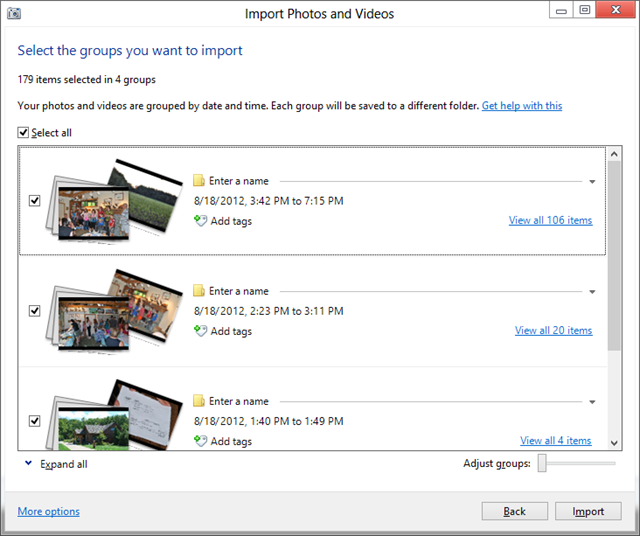 If a name for the group is entered, the import procedure will create a sub-folder by that name. 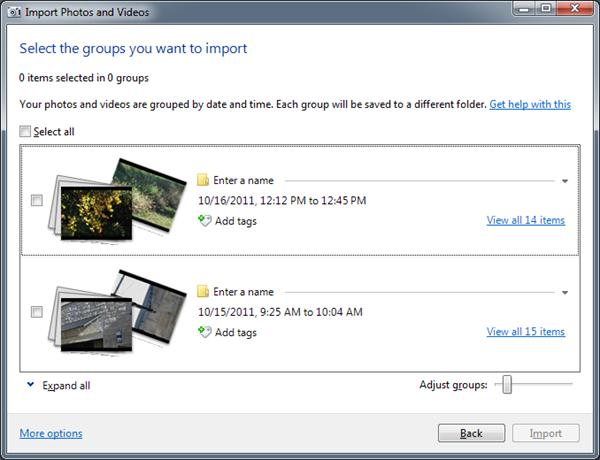 If no group name is specified, a sub-folder is created with the date when the photos were taken as the name followed by a number. For most of us, this is just fine. 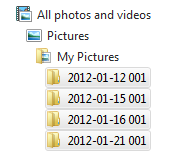 But what do you do if you don’t want sub-folders, but all the photos imported into one folder? Can that be done? 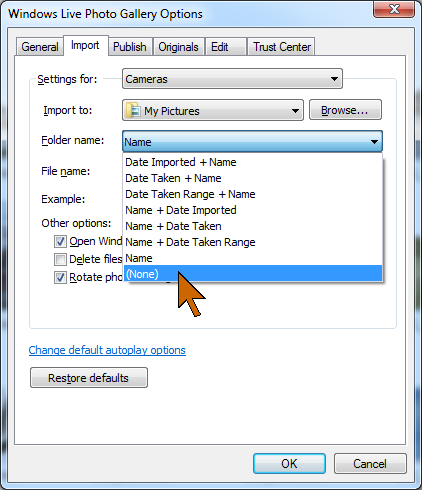 The process described above is for the default setting in Windows Live Photo Gallery. You can change the way photos are imported in the Live Photo Gallery Options menu. Click the blue File tab, then Options. 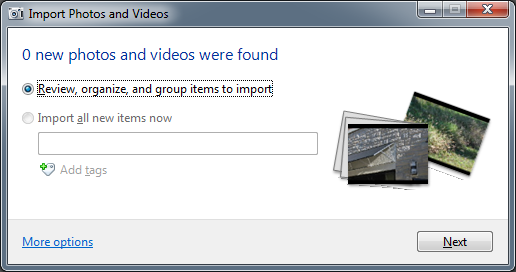 Click the Import tab in the options dialog. Click on the Folder name: selection, it is probably “Name”. The last item in the drop-down menu is (None). Click on this, then click OK. 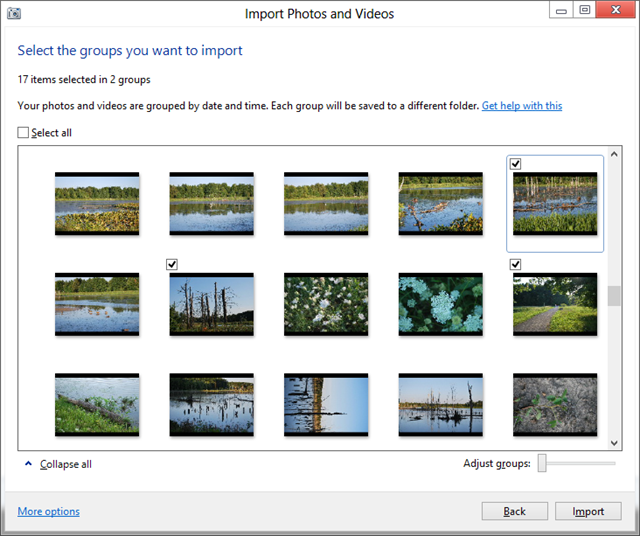 When folder name “(None)” is selected, no sub-folders will be made and all photos will be imported into the folder specified in “Import to:”. 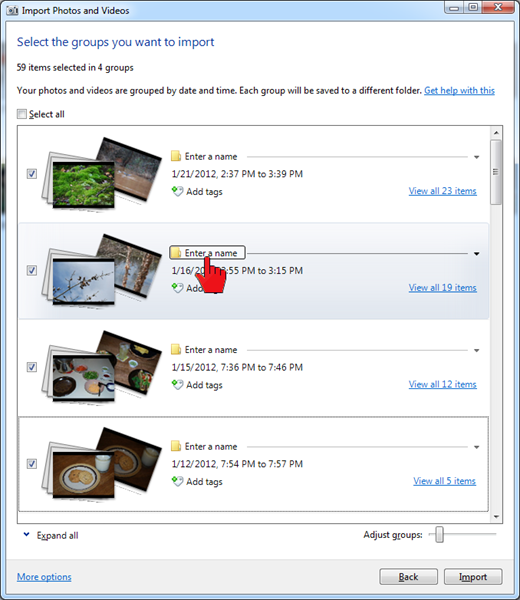 Note the Browse button which allows you to specify any folder on your system for storing your imported photos. How do I add 3D-effect text on a photo? For a title slide or the cover photo of an album, you might want the title set in an attractive, 3D-effect text superimposed on a photo. How can you create that without an expensive special purpose application? 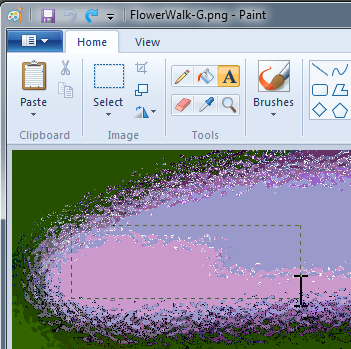 Here is a method that uses Paint, a tool you already have on your computer. Load your photo into Paint. 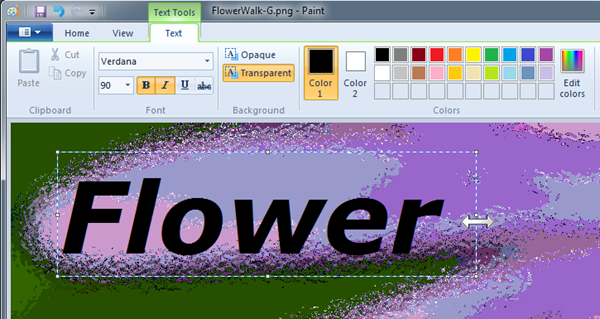 With the Text tool (see illustration) draw a text box starting approximately in the upper left position of the intended text. The text box will resize when you release the mouse button. You will now see a dashed box in your photo and the Text Tools ribbon opens. Type your title. As long as you keep your pointer in the text box you can modify the text and the text box. There are resizing handles on the box – you know you can resize when the pointer changes to a double-ended arrow shape. You can select the text by dragging the pointer over it. You can change to any font on your computer. The font size box shows sizes from 8 to 72. You are not limited to these sizes. 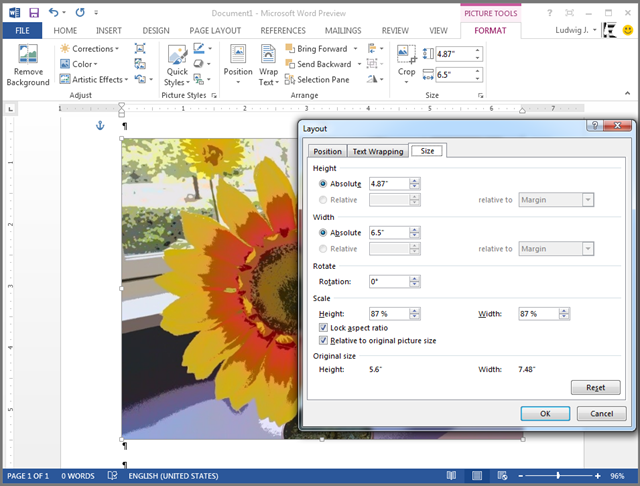 Just type in the size you want, even larger or smaller than the shown range, and the font will be changed to that size (note the size in the illustration above – it is set to 90). The text will be set in the Color 1 selection. For 3D-effect, shadowed text, select the darker, shadow color. Position the text box to place the text. When the pointer is placed anywhere on the box outline, except near the resize handles, it changes to a four-headed arrow indicating that you can drag the box to another position. When you are happy with the text, font, and placement, click anywhere outside the text box. The text is now set. If it isn’t right, click Undo (or Ctrl+Z) and start over. Next set the top color, normally a lighter shade, and open another text box and retype your title. Don’t worry about alignment, you can drag the text and place it precisely. Drag the text box to position the text just the way you like. When you are satisfied, click anywhere outside the text box. There are applications that can do a nicer job, but for shadowed text, Paint is easy and probably just as fast. In Paint the selection of color is more flexible than you might think. There is an array of twenty colors to choose from. To set the color click the color number, Color 1 is the main one, Color 2 the “right-click” color, then click the box with the desired color. If that does not provide you with the exact shade, click Edit colors. This opens an Edit Colors window. Here you have a wider selection of fixed colors and an opportunity to define custom colors. In the larger area you reposition the mark (drag it) to define the hue and saturation – color and intensity. The vertical slider control sets the luminance of that color. You can even enter numeric values in the fields to define the color. 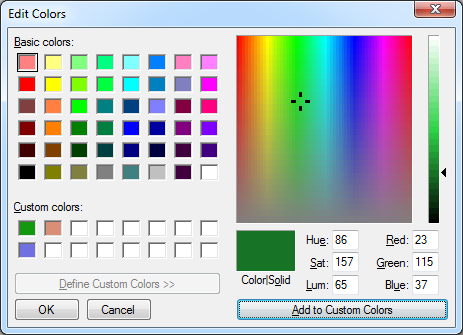 Click Add to Custom Colors and the specified color is added and will appear in the bottom row of color boxes. Click OK to complete the color selection. When you open the Edit Colors window the color presently set as Color 1 will already be set in the custom area. I find this particularly useful when I want a lighter or darker shade of a particular color. The luminance control can be used to select the shade without affecting the hue or saturation. Remember that the Color picker tool (the eye-dropper in the Tools area) can be used to pick a color from any place in a photo. This color can then be adjusted with Edit colors. Neat!